Due to Labor Day, I had a lot of time on my hands this past weekend and did a lot of baking. I was inspired by this month’s Daring Bakers challenge and decided to try my hand at making pâte à choux. Some of you may ask…what the hell is pâte à choux? Well basically it is a pastry dough used to make cream puffs and eclairs. I followed Alton Brown’s recipe exactly as written and it worked out wonderfully. I used a pastry bag fitted with a round tip and piped the eclairs and cream puffs onto parchment paper and baked according to the directions. The dough held it’s shape after it was baked and the inside was nice and hollow and ready to be filled with a delicious pastry cream. The pastry cream recipe was given to me by a friend and is from the cookbook, Baking at Home with The Culinary Institute of America. I then melted some bittersweet chocolate and thinly piped it over the eclairs and cream puffs. 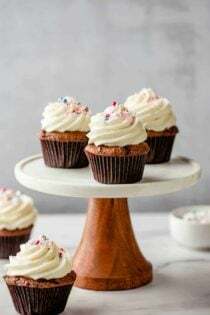 Although I thought the recipe may be a bit difficult and require way too much time, it was quite easy and really worth the effort because they truly were absolutely delicious! For Alton’s recipe click here. ***I am also now writing for Just Baking which is part of the Well Fed Network, you can check me out there, by clicking here. Glad to see the Daring Bakers August Challenge inspired you to try this! 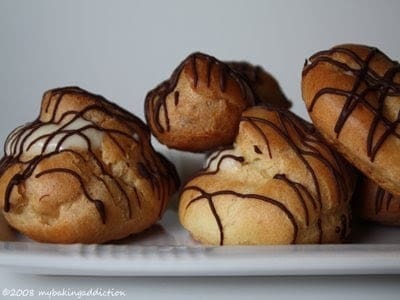 Your cream puffs look fabulous – and your photos are fab. My boyfriend (Alton) won’t steer you wrong – his recipe for pate-a-choux is a good one and the techniques he shared on his show really helped me out! Hello! 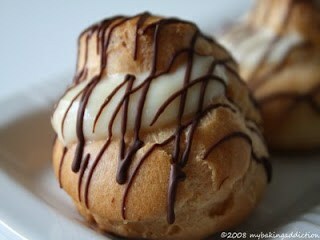 I wanted to welcome you to Just Baking, I saw your post there with these delicious cream puffs. They are my weakness and I may have to add them to my to-do list! Where is the direction to make it? And the ingredients?